Ok, so I’ve finally lost my marbles. I’ve always had a “problem” with being deeply into a lot of different things at the same time. In highschool I even read a 12 volume encyclopedia from A to L (I probably got a girlfriend around L, hurrah). I’ve always been that way, but I’ve also always been broke, so my hangups often never get beyond research and reading about a billion words about … anything. 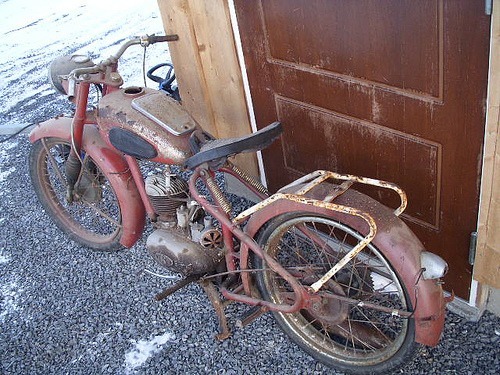 But yesterday I obviously turned a new leaf, by buying an old motorcycle from the 50s that has more rust than metal. 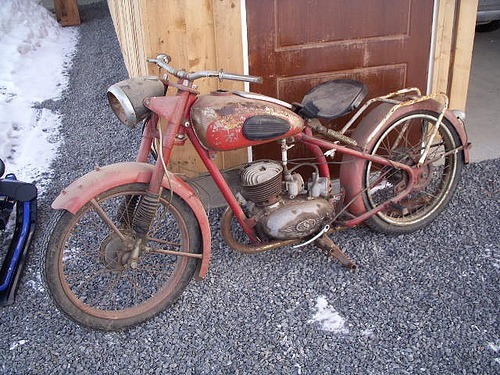 I’ve been drooling over it ever since I saw and ad for two weeks ago, and late last night, after receiving plenty of advice to the contrary, I transferred the money, and this evening the seller delivered it to me, a genuine, Made-in-Norway, Tempo Standard 150CC motorcycle. Here are two more images from the original ad. Do I have experience with motorcycles? No! Do I have a motorcycle licence? No! Do I have the time? Nope! Do I have a big grin all over my face? Hell yeah! I apologize in advance for endless posts about this project.